Drive-Master and IDS manufacture, distribute and install premium Hi-Tech Driving Primary and Secondary Controls for people with disabilities that are easy to install and effortless to operate. We incorporate the latest technology to make installation and operation as smooth as can be, while still maintaining the safety and reliability standards that our clients have come to expect from the leaders in the Hi -Tech Mobility Industry. The DM/IDS PGB system controls the OEM (Original Equipment Manufacturer) gas and brake pedals remotely and effortlessly. 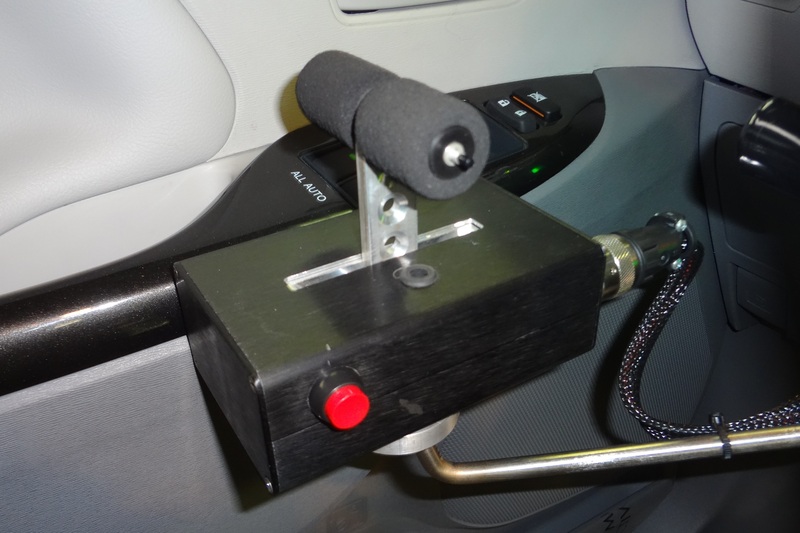 The PGB can be configured to push the lever forward for acceleration and backward for braking or vice versa. Various orthotics are available to operate the PGB including a single lever, t-bar and a tri-pin. The PGB controller can easily be placed within the users range of motion for optimal comfort and operation. The PGB lever can be combined with a pin switch for operation of in-motion secondaries using the DM/IDS VAS Visual/Audible Scan System. The DM/IDS RESS System is a remotely mounted small diameter steering wheel that requires extremely minimal effort and low range of motion to operate. It can be mounted anywhere in the driver’s cockpit area for the user to operate comfortably and safely. RESS has multi-axis mounting capability, so the user can steer the vehicle from a horizontal position or any mounted angle. There are three different wheel sizes available, 5″, 7″ or 10″. Various orthotics are available to operate the RESS including a knob, single pin and tri-pin. The system can easily be returned to the OEM steering wheel operation just by pushing and holding a button during ignition/start of the vehicle. RESS is equipped with a backup steering and monitoring system. The DM/IDS Proxima Tablet Touch Screen Console is a Tablet that will control the vehicles Ignition, Start, Power Gear Selector, Power Park Brake, power windows, door locks, radio, HVAC and all other secondary vehicle functions. It can be mounted as close to the driver as needed for quick and easy access. 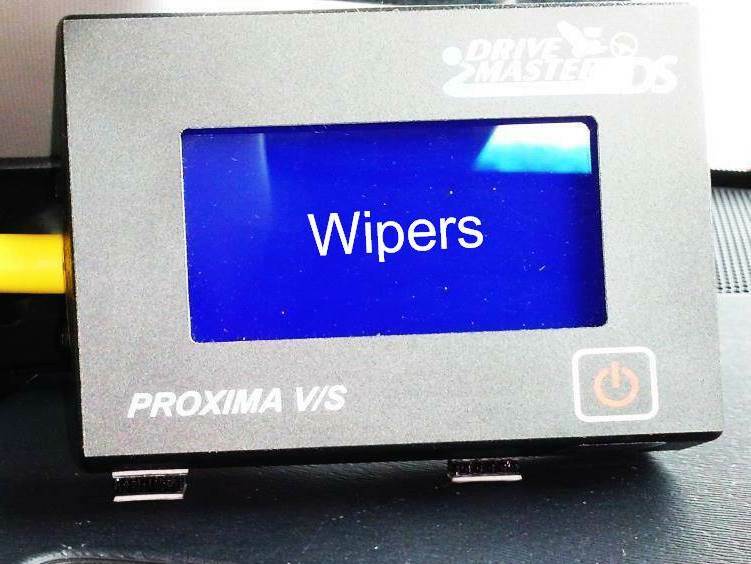 The Proxima Tablet program communicates with the vehicle via Bluetooth and is equipped with a hard wired auxiliary ignition/start button and power gear selector switch for back-up. Take the Proxima Tablet with you and use for email and web browsing as well. 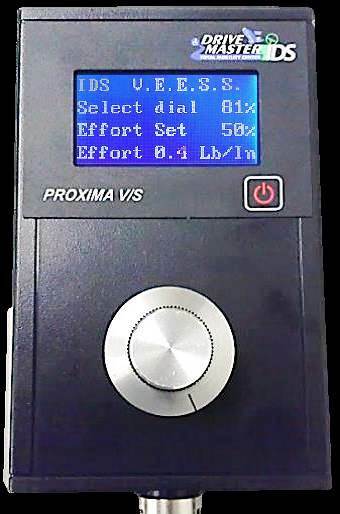 The DM/IDS VAS can be used in combination with the Proxima Touch Screen or as a stand alone unit. The VAS allows the operation of in-motion secondaries to be activated by a single pin switch mounted to the hand control, or an elbow switch mounted to the door. Four to Six main functions that require the quickest access can be initially programmed such as Left Turn, Right Turn, Horn, Dimmer. Additional functions such as Wipers, Cruise, Windows, Radio Volume, etc. can be programmed and toggled through a small 3″ LCD screen mounted on the left corner of the dashboard for safe viewing. Push and hold the activation button and a few seconds later the functions toggle through and display on the LCD screen. Once you see the desired function display, push the button again and it will activate that function. The DM/IDS GEN II reduces the effort required to steer a vehicle that is equipped with OEM (Original Equipment Manufacturer) electric steering. The effort can be reduced from 0 to 100 percent. Standard low effort reduction would be 50%, zero effort would be 100%, however our system can be fine tuned to the exact percentage needed, 34%, 65%, 86%, etc. Our GEN II is equipped with a Test Mode, Back Up Battery and Vehicle Monitor System which helps monitor, prevent and alert the driver if any failure may occur. The Back Up System will allow them to pull over safely to the side of the road. The GEN II is also equipped with a return to OEM steering mode. This allows the steering effort to be returned to the original OEM effort for other driver’s not needing the reduced or zero effort to drive safely and comfortably. 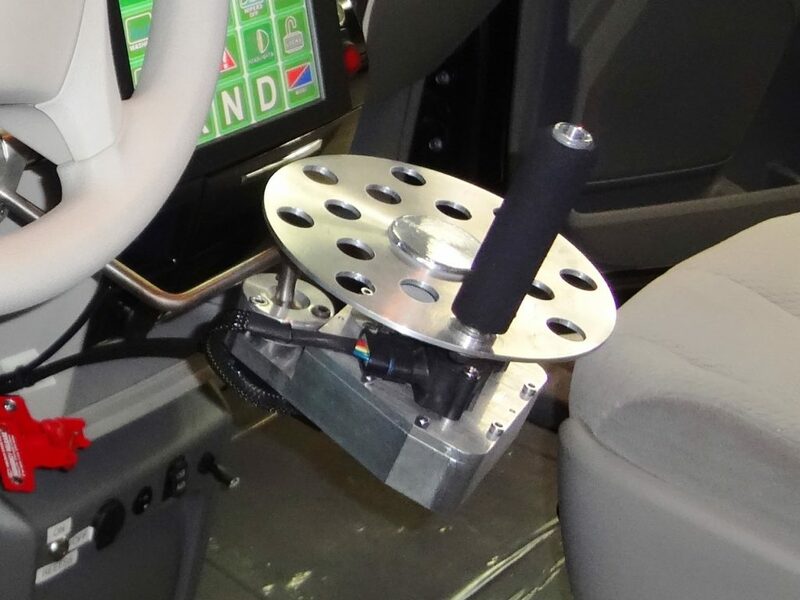 The DM/IDS VEESS allows a CDRS Driving Evaluator/Instructor to change the effort of the OEM electric steering system while they are conducting the actual driving evaluation of the client. 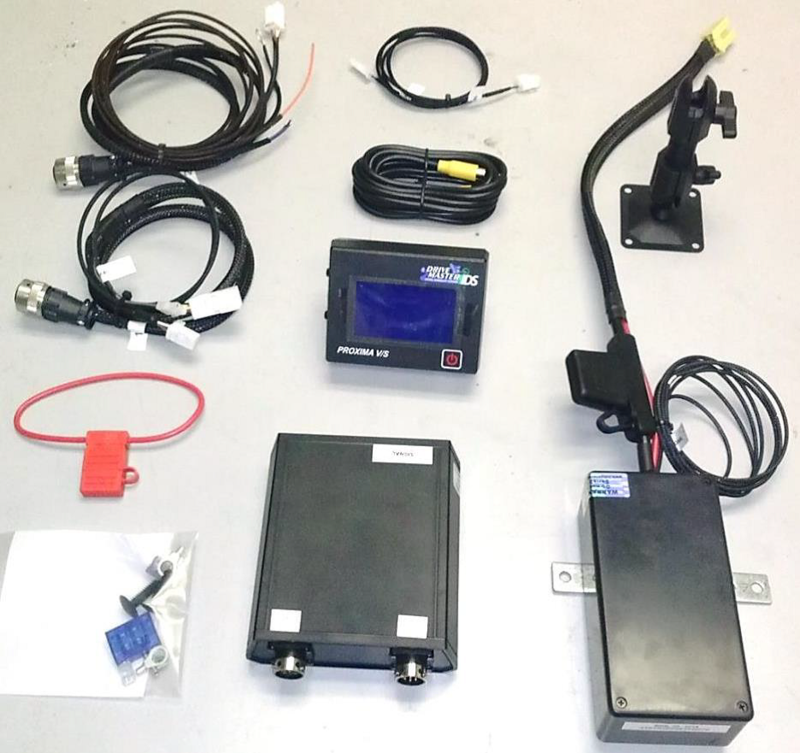 This system is specifically designed and available for the CDRS Driving Evaluator/Instructor only. The steering effort can be reduced from 0 to 100 percent on demand, either by hand-held or dash mounted control module. Simply dial in your desired steering effort reduction and push the button to set it. The LCD display will show you the desired and current effort setting. Once selected these will both be the same. It will also display the steering effort in pounds of pressure required to steer the vehicle. The DM/IDS VEESS is an invaluable tool for any CDRS to have while conducting their driving evaluation. EMC manufactures a variety of primary driving control options designed to operate the gas and brake steering controls of a motor vehicle. In years past, we developed a number of independent systems such as the popular EGB Electronic Gas Brake, DS-2000 Digital Steering, and DIGIDRIVE Digital Joystick Driving Control. Today, we manufacture one single control system, AEVIT. With the new AEVIT technology, more than ten different control input devices are available to meet your needs. Each of these different control inputs can be used in conjunction with the same control drive components and output servomotors to create a system tailored to your needs. The AEVIT primary driving control system provides a low-effort control solution for operation of the factory gas, brake, and steering controls. 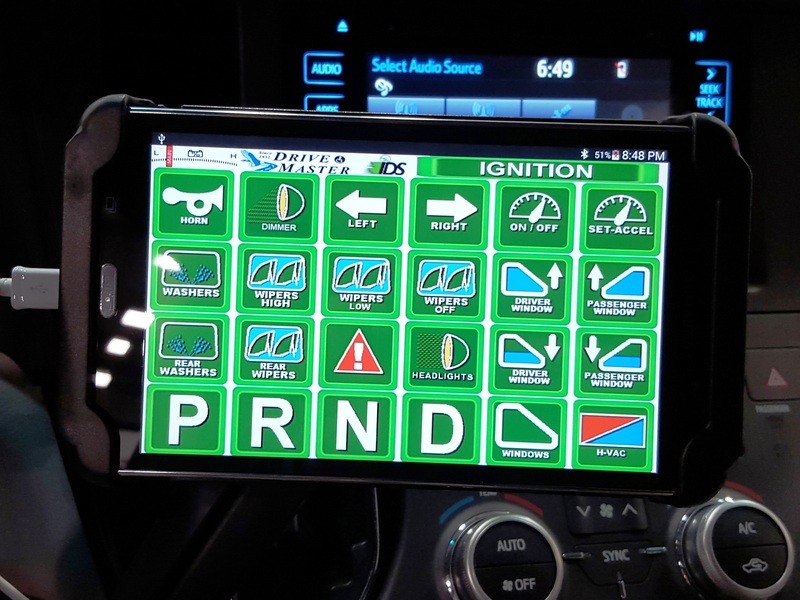 A variety of unique interfaces to the control system are available and can be mounted nearly anywhere in the driver’s area of the vehicle. These “input devices,” as they are called, have the look and feel of factory driving controls, but are designed specifically for the purpose of maximizing your abilities. As the acronym AEVIT implies, technology is the foundation upon which this remarkable driving control system is designed. AEVIT utilizes sophisticated microprocessor design and modern control area networking to convert your mechanical input into motion by the powerful output servomotors. These servomotors are installed to manipulate the factory gas and brake pedals, the factory steering column, or all three. Whether you require just gas and brakes, or just steering, or gas, brakes, and steering, there’s an AEVIT system for you! Electronic Mobility Controls, LLC is the worldwide leader in the design and manufacture of adaptive driving controls for persons with disabilities. We offer a complete line of both primary and secondary driving controls. Our products are distributed through a certified dealer network trained on the installation and operation of all EMC equipment. The secondary driving controls manufactured by EMC are designed to operate vehicle functions other than gas, brakes, and steering. We offer a variety of options for many different vehicle applications. Our controls can be purchased as a complete console system to complement your primary driving controls or they can be purchased individually. For example, if the AEVIT primary driving control system will be used to operate the gas/brake and/or steering functions in the vehicle, we recommend the Gold Series “complete” console system. On the other hand, if remote access is required for only a limited number of secondary driving controls, you may wish to consider the Econo Series console system. Of course for any application, one or more accessory stand-alone products may be desirable. Whether your application calls for voice activation or touchpad operation, EMC is committed to meeting your needs! Drive-Master is a certified dealer of Electronic Mobility Control products. Drive-Master provides full installation, integration, and service of all EMC systems.